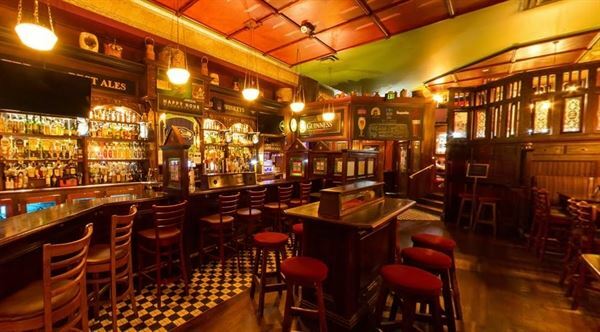 You will find our Seattle pub warm, inviting, and unique. Designed and built in Dublin, Ireland it offers a sanctuary of colorful hues accented with dark wood and Irish memorabilia. It's a perfect combination of urban sophistication and Irish charm. Our event team can customize every aspect of your event so your guests have an exceptional experience. Enjoy contemporary dishes alongside your favorite Irish fare and your favorite cocktails, beer and wine from our full service bar. Whether you're hosting an after work gathering, corporate event, special birthday, reunion, wedding related celebration or holiday party, we can promise you we're not your ordinary party spot. Our warm and welcoming pub creates a casual atmosphere for celebration, while staff delivers the best of food, drink and Irish hospitality. The Victorian Bar 30-35 Seated or 50 -60 Reception Style Our grand Victorian Bar section features the dark woods associated with 'high street' pubs in Dublin. Highlighted with brilliant splashes of color and intricate tile work. Whiskey Room 18-22 Seated or 25 Reception Style Enticing display of “Ol” country style tobacco dated back to the 1800?s. This cozy space will offer you and your guest a bit of relaxation while sitting back on our comfy booths surrounded by dark wood and unique decor. Dungeon Room 20-25 Seated or 25 Reception Style The most private room in the pub, adorned with gargoyles, candelabras and iron-clad windows. Gaelic Room 70 Seated or 120 Reception Style Huge murals, dark woods, and the massive dolman set the conversation for the evening. This area is perfect for the larger group ready to kick up their heals and have a few pints. Cottage Room 45-50 Seated or 80 Reception Style Light woods and kitchen staple bric a brac decorate this room. This room is light and warm, perfect for a small gathering. This room can be divided into 2 smaller rooms one accommodating 22-26 people seated or up to 35 people reception style and the other 30 people seated or up to 45 people reception style. The Whole Pub The entire pub is available for a larger group. We can accommodate up to 250. I would recommend anyone host a party of any type here. I did a buyout of the venue to hold our 300 person corporate team, and everyone was thrilled with the vibe and the atmosphere. The employees were all very attentive throughout the evening. We even had a minor medical emergency (low blood sugar) and the rest of the party barely knew there was a disturbance! The food is phenomenal, and Virginia Tabbut is one of the best people to work with in Seattle when it comes to event planning. She constantly checked in with me, keeping me updated on how things were going, adapting to change and helping me enjoy my own party, which as I'm sure anyone who organizes these kinds of things can attest is a rare occurrence. I literally showed up 30 minutes early and they had everything handled. It was awesome. There are plenty of bathrooms, I never waited in a line, and the flow and feel of the space is fantastic. Easy to find, easy to leave from and get home or continue celebrating throughout the night. Could not recommend this place enough. Located in the heart of downtown Seattle, the Hard Rock Cafe Seattle strikes the perfect balance in a city that boasts one of the most diverse and influential music scenes in the world, a city where Jimi Hendrix performed his first headlining gig, where upscale coffee was perfected, and where countless visitors flock each year to see the sights. Are you looking for the perfect Seattle event venue? Hard Rock Cafe Seattle is your best choice in the downtown area, with a variety of event spaces, including two floors, a bar area, an outdoor terrace with great views of the city, and our own live music venue, Cavern Club. We host all sorts of special events, from business meetings to birthday parties. Whether you’re planning an intimate affair or much larger conference, our Bellevue event space offers flexible arrangements for productive meetings. Spanning 5,750 square feet across seven meeting rooms in Bellevue, Red Lion Hotel Bellevue features event space with large picture windows, 12 foot ceilings, and a solid oak parquet dance floor. As one of the most sought after Bellevue event venues for weddings and professional events alike, the staff at Red Lion Hotel Bellevue is dedicated towards providing a space for you to impress your guests, marked by unparalleled service, A/V equipment and delicious full-service catering. The Factory Luxe is a flexible private event space located in the historic Old Rainier Brewery in Seattle’s SODO neighborhood. Our beautifully restored space supports a wide range of table and chair configurations. If you’re hosting a formal wedding for 60 guests, no problem. We’ve got you covered. We’re also a great option for corporate events whether you need conference style seating or more informal cocktail tables. Your guests will love our fireplace and casual lounge area. The Factory Luxe can hold up to 200 for a standing reception, 100 for seated dinners and theater-style events. The main 2,500 square foot room has hardwood floor perfect for dancing and stage with sound & lights set-up. Add to that the 17' bar with tap systems available and gas fireplace, this is like your own private underground location. "The Vault Room" is a 600 sq ft additional space available that acts as a back lounge with its own independent music system and cozy atmosphere. Our professional staff of planners and chefs will provide all your banquet and catering needs from Weddings and Receptions, Meetings, Banquets (from 30 to 500 guests), Celebrations, Employee Parties and Box Lunches It’s our goal to provide our clients with an experience that exemplifies great service fine cuisine. We offer a wide variety of menu options to fit your needs and budget. Mercurys Coffee Co. has been a staple in the Pacific Northwest for the past 20 years by providing customers astounding service and Outrageously Good Coffee®. We are now accepting reservations to book our Headquarters (located in Bellevue) for your next corporate meeting, training, party or any other personal/company function. For meetings: The space features a sound proof conference room with ample seating, TV with casting ability, and ample seating for up to 20 people. For parties/functions: Two large couches (that can also be removed), multiple SONOS speakers and sub-woofer, dimmable lighting, LED light features, and a modern theme. We also have a full coffee bar set up and can provide staffing to make your favorite cafe drinks. Emerald Downs is the Northwest's year-round answer to first class events. Our state-of-the-art facility and experienced staff will help make your event a success. From company meetings and tradeshow events to class reunions and receptions, Emerald Downs can handle all of your needs. Make your next corporate picnic, family reunion, or birthday party unique by adding the excitement of Thoroughbred racing. Whether you choose the elegance and privacy of our Triple Crown Suites, a delicious buffet in the Emerald or View Room, or a Barbecue Buffet in the Paddock Park, our Day at the Races parties promises to turn every event into a winner!